Attirampakkam is an open-air Palaeolithic site situated near a meandering tributary stream of the river Kortallaiyar, northwest of Chennai, Tamil Nadu, along the southeast coast of India. Discovered in September 1863, by Robert Bruce Foote and his colleague William King, it was investigated in the early to mid 20th century by several scholars- T.T. Paterson, V.D.Krishnaswami and K.D.Banerjee. Ongoing research at this site has resulted in new perspectives on the Acheulian and Middle Palaeolithic in South Asia. behaviorS.Pappu's doctoral dissertation on the prehistory of the Kortallaiyar river basin (see publications), highlighted the importance of the context of artefacts at this site, in addition to other observations on the nature of the prehistoric record of this region. 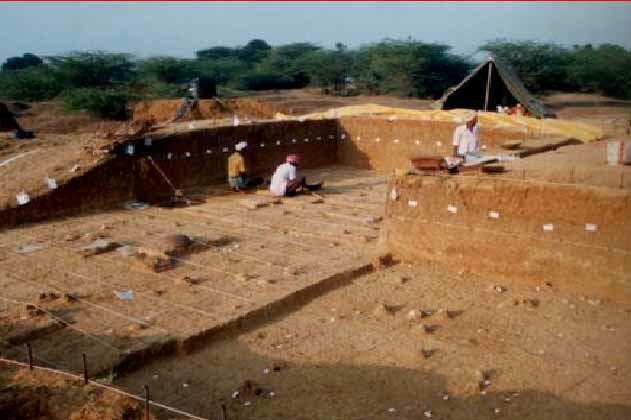 Excavations at Attirampakkam were initiated in 1999 to establish the stratigraphy and culture sequence, to obtain a secure chronology and to study the assemblages with a view towards investigating changing patterns in hominin adaptation over the Pleistocene. You can read more about our research at this site here. You can read more about our research at this site here. Establishment of a long stratigraphic sequence of stratified Acheulian and Middle Palaeolithic occupational levels. Studies of sediments that resulted in new perspectives on palaeomonsoons in this region over a period ranging from the Early to Late Pleistocene. South Asia is rich in Lower Paleolithic Acheulian sites. These have been attributed to the Middle Pleistocene on the basis of a small number of dates, with a few older but disputed age estimates. Here, we report new ages from the excavated site of Attirampakkam, where paleomagnetic measurements and direct 26Al/10Be burial dating of stone artefacts now position the earliest Acheulian levels as no younger than 1.07 million years ago (Ma), with a pooled average age of 1.51 ± 0.07 Ma. These results reveal that, during the Early Pleistocene, India was already occupied by hominins fully conversant with an Acheulian technology including handaxes and cleavers among other artefacts. This implies that a spread of bifacial technologies across Asia occurred earlier than previously accepted. You can read more about this paper by following this link. You can also check out perspectives on this paper by Robin Dennell in the same issue of Science. A comment on this paper is also present on John Hawks web blog or on Sheila Mishra's web blog.